Bright Finish. Includes hood. 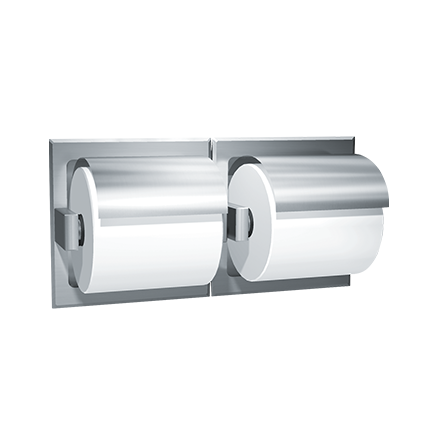 Recessed Double Toilet Tissue Holder holds and dispenses all standard core roll tissue up to 6’’ diameter (Ø152) roll (holds two (2) rolls). Fabricated of stainless steel type 304 alloy 18-8. Roller is chrome plated high impact resistant ABS plastic and spring-loaded. Optional finish and mounting style must be specified as either bright and wet or drywall. Specify finish and mounting by adding code suffixes to model number (i.e. 74022-HBD or 74022-HBW).